Metal forging and hot forming are excellent induction heating applications. 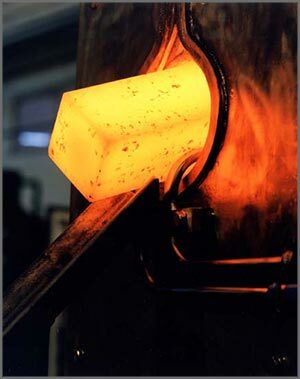 Industrial forging and hot forming processes involve bending or shaping a metal billet or bloom after it has been heated to a temperature at which its resistance to deformation is weak. Blocks of non-ferrous materials can also be used. Induction heating machines or conventional furnaces are used for the initial heating process. Billets can be transported through the inductor via a pneumatic or hydraulic pusher; pinch roller drive; tractor drive; or walking beam. Non-contact pyrometers are used to measure the billet temperature. Other machines such as mechanical impact presses, bending machines, and hydraulic extrusion presses are used to bend or shape the metal. Induction heating machines are commonly used to heat steel billets, bars, brass blocks, and titanium blocks to the proper temperature for forging and hot forming. Induction heating is also used to heat parts such as pipe ends, axle ends, automotive parts, and bar ends for partial forming and forging processes. Heat can be directed to one specific point, which is highly important for parts with only one forming area. Greater thermal efficiency - heat is generated in the part itself and does not need to be heated in a large chamber. Better working conditions. The only heat present in the air is that of the parts themselves. The working conditions are much more pleasant than with a fuel furnace. Induction forging offers precise temperature control.